Oh bother, I am going to have to eat them all! In my life and work I have the chance to work with a variety of people. The joy of being both a civil celebrant and a pre school teacher is that I get to work with families and individuals at the beginning, in the middle and at the end of life. I would not like to say which stage I enjoy most. It may sound cliched, but the opportunity to reach out to someone who is in need is as powerful a gift as any I can imagine. People, however strong and determined and capable they appear need support. Whether it is hand on the shoulder, a smile or a hug ... we all need interaction with others to confirm that we are okay; in the right place and making the right choice. I cannot pretend to know everything and as I get older and a little more experienced I have learned to value the friendship and expertise of others. The support that has been shown me by other celebrants and teachers through my career has been extraordinary. 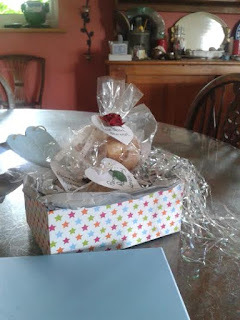 This morning this beautiful package of shortbreads arrived from Julia Hill of Silverlode Celebrants - no other reason than a gesture of friendship and kindness. Julia and I have never met; we share thoughts and quotes on line and we work in the same field and not far away from one another. How generous and bad for the waistline is that! !